Shelley Keith is a digital strategist with Modern Tribe. Her pragmatic approach to content governance aligns stakeholders on the “why” behind content decisions and uses techniques like “guerrilla governance” to get the content outcomes that executives demand. Shelley Keith‘s career has taken her from a passion for technology to passionately advocating for the people who use technology. 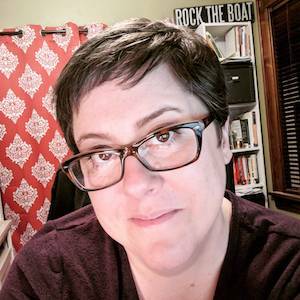 Spending many years working in higher education digital communications and marketing made her hyper-aware of the challenges at the intersection of successful web content and practices and the “other duties as assigned” quagmire. Today she’s a digital strategist for Modern Tribe tackling enterprise content strategy and technology projects. Her web governance work is focused on higher education and non-profits with some enterprise lessons mixed in for good measure. She’s made her Web Governance Through On-Demand Online Training program scripts & slides freely available and regularly posts her latest slide decks in a moderated Facebook group you’re welcome to join. Hi, everyone. Welcome to episode number 31 of the Content Strategy Interviews podcast. I’m really happy, today, to have with us Shelley Keith. Shelley’s a digital strategist at Modern Tribe, a digital agency that helps people put their websites and other stuff together. So I’ll have Shelley tell you just a little bit more about herself. Thanks, Larry. So my role at Modern Tribe is digital strategist, which essentially means I’m a professional generalist. I work with a really amazing team of developers, project managers, designers, to build enterprise WordPress implementations. That’s pretty much where our focus is. And my background, I came, I’ve been working on the web since like 1994. I came out of hosting and development and I worked in higher ed for about 15 years before I moved to Modern Tribe. I’ve done this my entire professional career. 94, that’s going back there. I remember that was just, I think Mosaic came out the year before or something. I have very fond Netscape Navigator memories. Okay, that’s right. Yeah, the good old days. I want to talk today about content governance. You do that in the context of your overall digital strategy role at Modern Tribe. First of all, a lot of people when I say the word governance, a lot of people, their eyes roll back in their head or they have this curious look on their face. Can you help them out and can you just define content governance for us? Basically my definition is “ensuring that the site is working for the institution by effectively stewarding resources for optimal outcomes.” So “getting what you need where you need it when you need it.” I know that a lot of the definitions out there are really around accountability, roles and authority and processes. A lot of times … and those things are important. But a lot of the work I do kind of simplifies that a little bit to what is it going to take to make this an effective web presence? I love that. That’s a very pragmatic approach, which probably works most places I’m going to guess. Can you talk about like a typical implementation. We were talking a little bit before we went on the air about it’s not all about just policies and procedures and manuals and stuff. It’s really about actually getting actual adherence to the things that you want to have happen. Can you talk a little bit about how you help make that happen? My approach is pretty interesting because usually what I’m working with is organizations that just don’t have the resources to do big formal governance plans with all the requirements and documentations and all of those things. So a lot of times, what I work on more than most things, is finding ways to build opportunities to empower users and do that in the direction that you need to go. So thinking about essentially it’s a stewardship model. We’re building conscientious stewards with clarity and awareness of not only institutional goals and where they’re supposed to be going, but also building in some kind of why’s on that. Like why accessibility is important, how SEO ties to their content and accessibility and all of those things. So tying together not only the things that stakeholders care about, like their . . ., but also finding ways to make them aware of and make them care about other things that are really important to the institution. Right. There’s a lot of ways you can do that. Is it mostly, is it training? Is it … how do you get that across? It does tend to be training. My approach is very much about training and I build training in a way that ties a lot of things to accessibility. It ties a lot of things to SEO and because outcomes are kind of where stakeholders care, you can take just about anything and tell the story in a way that makes SEO and accessibility important. Interesting. The way you said that, you said the things stakeholders care about: SEO. It’s that sort of a top level consideration for a lot of your clients? Yeah. A lot of this approach came around from some work I was doing in higher ed and I don’t know how much of your audience is higher ed, but I think a lot of people can relate. We had a lot of internal stakeholders who were really unhappy with the outcomes and search results around their programs. And they were really unhappy with internal search results around their programs. Basically kind of training these users that the search results are not this magic black box, that the web department has the ability to make magically better. It’s all about the content and making sure that you’re paying attention to your users. So it was fairly easy to take all of the message architecture and all the marketing work and the branding work and data about search engine results and SEO and then tie it to accessibility and create a training program that not only helped them achieve the goals that they were going for, but also help the institution work on things like compliance. Got it. And that would be more around the accessibility stuff I assume, the compliance part of it. Well, compliance is … in this case, a lot of it was accessibility because accessibility is this kind of magical ticket that a lot of people don’t understand. But if you’re a good story teller, you can make a lot of things relate back to accessibility. And in reality, a lot of things do link back to accessibility. So Google penalizes you for bad accessibility, for non standard code, for bad content, for all of those things. So being able to tie a legislative requirement (<a href=”https://www.section508.gov/”>508</a>) essentially and the outcome that they’re going for which is better search engine results, which is better whatever, participation in the programs together made for a pretty great training. Now, again, compliance was style guide. Compliance is writing for the web. Compliance is a lot of things in kind of a bucket. But again, writing for the web is even one of those things that you could easily tie back to accessibility. Here’s the right way to do this – blocking, chunking, all the kind of super basics that benefit accessibility and also benefit SEO. Right. All this, I can picture how the three of those, there’s kind of three things you mentioned there. The accessibility issue, the findability on your internal search whatever mechanism is and then the SEO, the discoverability and then the appeal to Google and the other search engines. So the training you do, is it about … you mentioned that there’s a writing component to it. But there’s also, there’s different technical and semantic and other things you have to do for each of those goals, like accessibility and findability and SEO. What’s the scope of this training? So I build out training that you have to get through the why, why are these things important and why am I doing these things and how are they going to help me before you get into how. And by that I mean how practically does this happen in the CMS. How do I make sure that images have alt tags? How do I put headers in place in my page content? All those things. That comes after because 99% of the time, your stakeholders who are going to be managing web content just really want to get the CMS and if you let them before you have them trained on what good means, or what the right way is and why it’s the right way, then you’re going to have issues. So that was one of our … it’s really important to get them through the why and to build accountability by sending them through a why training at the why training. And it’s one of those things, putting them through the why before handing them the how, just makes for better outcomes. You can’t make everybody care about everything, but it does at least build accountability. You now have this group of people who know better. Gotchya. That raised an interesting management issue where I’m just imagining in my head, you don’t have to care, but you have to know. But I wonder … but knowing that why, I wonder how often do people get, do they go oh I do believe in that and I do believe in why we’re doing this and really want to do it. Maybe they go get another job or, I don’t know. I think the bigger point there and the general principle that seems to work is once you know the why, it’s sort of like having over arching policy or a vision that makes everything unfold more gracefully underneath it. The why is that same kind of mechanism right? Right, absolutely. I forgot exactly what I was going to say there. I want to jump around a little bit anyway because you mentioned a minute ago one of the things you teach about is style guides and things like that. One of the ways I’ve had, when I think about governance and talk to other people about governance, a lot of people are helped by just sort of having a list of deliverables. Like okay, what’s a governance program going to give me? Am I going to end up with a style guide a voice and tone guide? What are the typical … you said that you’re often working, not so much off of a bunch of documents and things like that, but what are the areas I guess or the components of a good governance program? Well, I don’t want to say good, but a kind of pragmatic and functional governance program in an environment where you don’t have a lot of resources and don’t have, and by that I really mean human resources. You don’t have a lot of people to oversee what’s going on with a website and you have to rely on a variety of other duties as assigned kind of folks to do content management, I think that it’s really … it’s a very clear understanding of where you’re coming from and where you’re going. Like what your goals are with the website. And this is all, what it is I do want to say is your governance plan can’t come, well it can, but it’s very much harder to bring that in as kind of an afterthought. Oh, how are we going to manage this? Who’s going to do what? That kind of thing. It’s a bad idea to try to do that afterwards, although it’s better to do it afterwards than to never do it at all. But I really, we use all of the research that gets done in a project, we’re digging through analytics. We’re looking at accessibility reports. We’re basically going and finding any data that we can to start to create wanted outcomes. Where are we trying to get to? And then build a plan and training around those things. So, if your an organization that you’ve got excessive outdated content, you’ve got accessibility issues that, and with all of the accessibility complaints that have been filed within the last couple of years, it’s a really hot button issue. Take all of those data points, Alexa, comparables with other organizations that are the same and start to measure progress and success. And some of those measurements are broken links and spelling errors, which are completely going to come from governance issues. And just figure out where you’re trying to go and then from there, figure out what you need to do to get there. And put together a plan. Oftentimes, it just keeps coming back to the basics. It keeps coming back to making sure that people have clarity and awareness on that there is a right way. There are a lot of right ways. There are a lot of wrong ways. Here’s the right way that we’re going to go and take them in that direction and give them some tools to make good decisions. Got it. That sort of happens at the … well, that kind of gets into another question I wanted to ask you about. That sort of gets into how each unit that’s creating content is managing it’s folks. So that kind of makes me think also about the scope of governance, of governance of content. There must be people who are creating or in forming your content or in other parts of the organization that aren’t directly under the privy of a content person. How does that scope, how does that ripple out I guess from the central content activities in an organization? I think my approach, what we’ve done in the past is essentially designed for exactly that scenario. You, what I say very often is, we can’t control everything in these environments. That’s part of the resourcing issue. You don’t have the ability to police the whole site. You have to give people the tools to do the right thing and then try to keep touching base with them, try to keep relationships going. But you can’t … workflows in a lot of those environments, workflows are a terrible idea because you’ll just bottleneck and you’ll never get anything out the door, you never be able to accomplish . . .
Tell me a little bit more about it because that’s such a classic tool for managing the creation of content, how do workflows fail in those situations? If you’ve got 250 content contributors across campus and you’ve got one or two people who can approve content or approve changes, then you have very quickly got a bottleneck. That really strains relationships. And it’s very easy and what I call it a highly Democratic environment such as a university, it’s really easy to let that bottleneck become a port of contention and cause problems with your C-suite relationships. Because they’re hearing a lot of people complain about stuff on the website and that is not a hill that I’ve been willing to die on in the past. There’s so many other places where energy should be spent. And part of the goal of training in this scenario is to make those people responsible and to tie those responsibilities to reasons that are relevant to the institution through, like I said, through legislative requirements, through strategic plans, through whatever you can tie things to to give them weight. Gotchya. What you were just saying about the bottleneck when you have two or three approvers and 250 creators, like I said, you mentioned the word pragmatism a couple of times. You’ve also talked about how important the stakeholder stuff is, the stakeholder relationships. So I’m just picturing … you’ve done this a while. How do you anticipate and deal with that? How can you help people avoid that problem? Yeah, because you’ve seen that. I’m just picturing you now as you work with a project going like, “Uh-oh. I see this problem of 250 contributors and two approvers looming.” How do you nip that in the bud? Very carefully. How that gets done depends entirely on the politics and culture of the institution. So it’s not … you can go the same direction, but how you get there is not going to be the same for everyone. Basically, it’s just a matter of kind of lots of conversations, pulling together key stakeholders, the project’s points into meetings and having conversations about how their culture works and figuring out what will work to kind of head this off at the pass early on. And having a plan in place and communicating that plan out to the rest of the campus, to all these content contributors as the project goes on. I am really big on transparency, but I’m really big on intentional transparency. So making sure that the right message is getting out to the people who need to hear it so that you’re minimizing kind of surprises and the angst around change. Mind you, the biggest chunk of this is you’re dealing with a whole lot of people who don’t have web in their title, don’t have any formal training necessarily. This is other duties as assigned so they’re already probably overwhelmed and this is just one more thing. And when you start trying to layer on governance, it just becomes this PR nightmare. Everybody is just really stressed out about it and if you’re in an institution and you need support and buy in, it’s all about the story that you tell. Yeah. Everything you’re talking about there, there’s two things that keep coming up over and over again in these interviews. It’s like that everything is bespoke, that every organization, every entity, every individual is unique and you’ve got to figure that out and account for that in your content strategy. And the other thing is that it’s all about people and relationships and those two things make for a very interesting governance environment it sounds like. Yeah. So that kind of gets the … I love your pragmatic approach to this and that it’s all about figuring out those people relationships and things that have to happen. Are there places or are there situations in which there’s more like, I don’t want to say enforcement or compliance, but there must be situations where just this push comes to shove and there has to be like a decision made. Do you build in things like that? Like points at which it makes sense to go to a decider or an owner of an issue to to make sure things are happening? Yeah, absolutely. And that’s why things are tied to strategic plans and cabinet-level dictations for lack of a better word. And things like accessibility, things that you have kind of a line in the sand on some stuff. This is why we have to do these things this way. I also, I call this, because this is kind of a non invasive approach to governance, the training and all of that stuff. But I kind of think of this as guerrilla governance as well because it’s not, especially when I was working in an institution, it’s not beyond me to, depending on what the thing is to do. It like guerrilla A/B testing, secret [A/B testing, to show that something is not as effective as they think it is when it’s the thing they want to do. I have very few hills that I’m willing to die on. I will let you fail yourself. I will do everything I can, but then I’m not going to force you to succeed if you’re absolutely against success in a scenario. But I will, there are a couple of places and accessibility is one of them. We are going to be accessible. We are going to structure our content well. We are going to be supportive and inclusive of everyone who could possibly be interacting with the institutional website. That is the place where I will draw the line and absolutely not budge off of it. And that has gotten me, because again, like I was saying, you can get a long way with accessibility by this will be more accessible. If this doesn’t pass basic accessibility testing, this is … your headers are in the wrong order or whatever because things like, “Oh, I want this header to be this size. I don’t want the H2 size, I want the H4 size. I’m going to nest these weird,” and those kinds of really super basic things can have a big impact. So that’s kind of, really accessibility tends to be the one place that I will draw the line in the sand. And this is, we’re not going past that. No, and that’s a good technique too. As you were talking, I was like, I hope she writes the guerrilla governance how to guide or something because you’re just looking … because that’s one of those points you identity and say okay, accessibility. I’ve got legal authority. I’ve got a lot of support. It’s a hot topic right now. I can use that as leverage to get better semantic structure for my content, which is so important for other things. Right. One of the things I talk about in my workshops is that it is … we’re the experts, especially in a campus environment. Oftentimes in any organization where we are, those of us who have been doing it for a long time, we are the experts. So figure out what you need to do to get to whatever your goal is and then begin to tell that story. Yeah. I think I want to empower people in these roles to stand up and be heard and help move the web forward. Right. Right. You’re a Karen McGrane fan then. Yeah, everybody is. Yeah. I think I work her name into every episode somehow it seems like. We’re coming up close to time. I always like to … well actually, let me ask one other thing because a couple things you’ve mentioned get at the bigger scope of governance, like this notion that you have that leverage of the laws and things about accessibility that govern that. But there’s also the bigger conceptual thing of how the content governance fits into the overall governance plan for, especially in these big institutions you’re operating in. Are there insights about that or things that you’ve identified where … is there anything you have to say about that, about how content governance fits into overall governance in an organization? Yeah. The website is the single most prolific, I guess, piece of material out there in the world. It is the thing that more people see about your organization than anything else. It’s the first place people go. So whatever your organizational goals are, whatever you do, whatever your sales goals are, whatever your admissions goals are, whatever those things are and whoever you are as an organization, needs to be reflected in that. So web content is not this stand alone, tucked away bonus. Your content is who you are. More so than … sometimes the people you’re sending out to have conversations, like your sales folks, your website is who you are to a lot of people. It’s a gateway to getting conversation and the story. So it’s not this optional thing. It’s maybe the most important thing that you do to start conversations. Now that makes perfect sense because that’s the first way that I think most people find out about any entity. Hey, we’re coming up on time Shelley. I always like to give my guests a chance, if there’s anything left, if there’s anything I haven’t brought up or that we haven’t talked about, or even just anything that’s on your mind about the web or content strategy, any crackpot theories, anything like that. But anything left that you’d like to share with our folks? Yeah. I just want to talk about storytelling for a second. I think that everybody needs to think about this instead of all the policies and procedures that we need to get in place, think about telling your story in ways that are valuable to the outcomes that you’re going for. In a lot of cases, that’s taking the realities of whatever your current situation is to the c-suite, the higher level, the presidents council whatever, and talking about the real issues. Because they’re hearing a lot of things about people being crabby about the website for one reason or another. But taking them some real data and telling the story around that data in a way that says hey, here are the real issues. We can fix that. For instance, we have all of these broken links, spelling errors, accessibility problems, but these aren’t redesign issues, these are content strategy issues because we’ve got 250 people touching the website who never had any training and that’s why we’ve got content that’s literally 10 years old and not been touched and we’ve got 150,000 pages because people just keep building new stuff and not doing anything with the old stuff and all these things. And here’s how it’s affecting the brand. Here is what it looks like to new people coming in who are coming in, 75% of whom are not coming in to the home page, which is the only page that anybody actually seems to care about, but it’s not really the most important piece of content out there. I probably can’t stress enough the value of storytelling in building a successful governance programs. That’s great. One of the questions I didn’t get to is, I was going to ask you about the benefits of having a content strategy and having a governance program and that’s it right there. It gives you the … everything you just said about broken links and spelling errors and all the stuff that reflects poorly on you. All the bloated content and all that stuff to have a plan for dealing with that is a huge benefit. It is. Build baselines and show success and talk about that every time that you can because otherwise you’re just spinning your wheels. You can go talk about all the great things you’re doing, but if you can’t show success, then everybody else’s opinion is as good as yours. I’ll put a note on the show notes. Just skip ahead to the 29th minute and build baselines, show success. That’s all you need to know. Well thanks so much Shelley. I really enjoyed talking with you.